Just as a line is made of an infinite number of points, a plane is made of an infinite number of lines that are right next to each other. A plane is flat, and it goes on infinitely in all directions. A sheet of paper represents a small part of one plane. But actually a sheet of paper is much thicker than a plane, because a plane has no thickness. It is only as thick as a point, which takes up no space at all. So a plane is like an imaginary sheet of paper, infinitely wide and long, but with no thickness. When we talk about a triangle or a square, these shapes are like pieces cut out of a plane, as if you had cut them out of a piece of paper. But is there another way to create these polygons? Some geometers are very interested what happens when a plane intersects or cuts a 3-Dimensional shape. Examine the GeoGebra workspace. The light blue rectangle represents, like a piece of paper, a small part of a plane cutting through rectangular prism -- a cube. 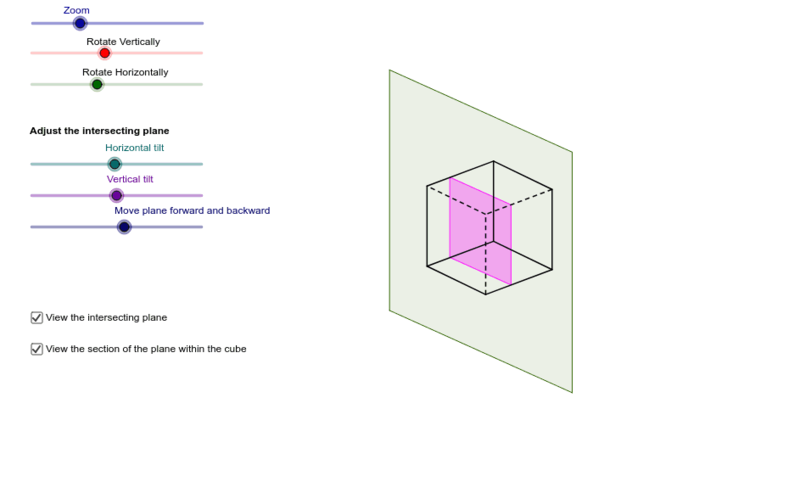 The magenta shape represents the polygon that would be formed if the plane actually cut the cube. Use the various sliders to experiment with different “slices” of the cube. Observe what polygons are created when a plane slices through a rectangular prism like a cube. What shapes did you observe? You should be able to construct a square, a rectangle, a triangle and a trapezoid. Construct each of these polygons by slicing the cube with the plane. Copy an image of each to the clipboard and paste the image into a Word file. Print the Word file and add it to your Math Journal.